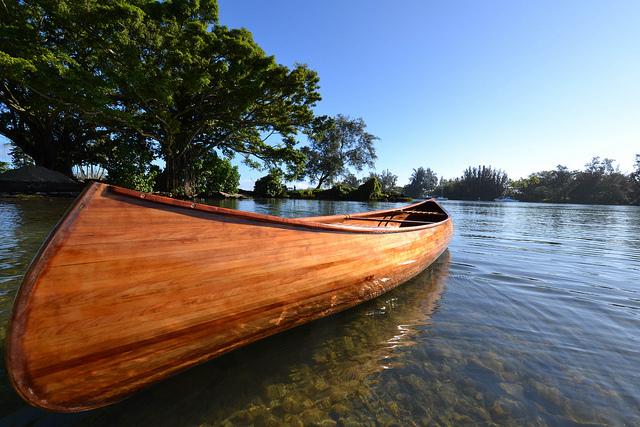 Richard Hudak, of Hilo, Hawaii, built this gleaming 16′ canoe from sugi cedar. He cut the tree down and milled the wood himself. He made the gunwale and seats from sprice, and the rails, stems, and breasthooks from koa. He made the paddle from Portuguese cypress, spruce, and sugi cedar. This photograph was taken on New Year's Eve at Reeds Bay on the Big Island in Hawaii.